Yep, you are correct; you are being cheated out of your accustomed Sunday morning reading enjoyment, muchachos. Since my retirement last year, I've had a pretty good track record of delivering something new here every cotton-picking week, week after week after week. This here is something, but it ain't much…a few pictures from the just completed 2014 Deep South Regional Star Gaze Spring Scrimmage. How’d it go? That you will find out next time. 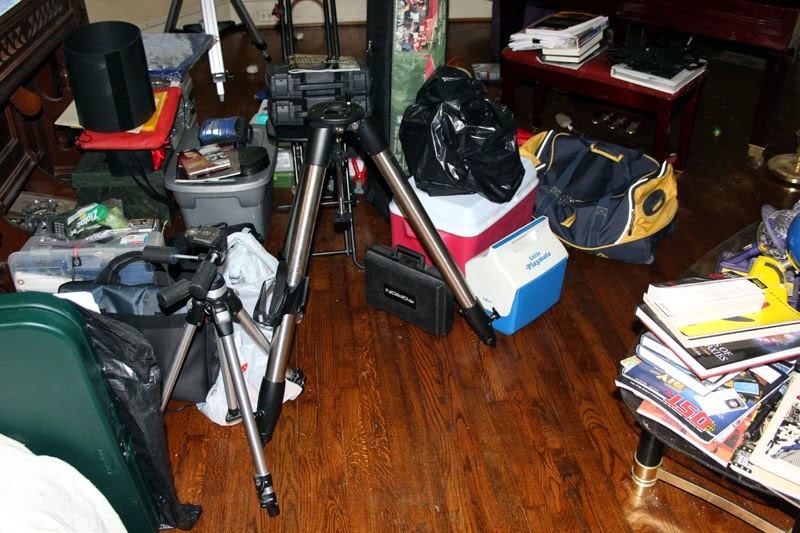 Right now, I am hard at work on an assignment for Sky and Telescope as I sit in my Lodge room waiting for dark. Can’t get through Sunday without the Little Old Blog from Possum Swamp? May I remind you there are years of articles here—a veritable treasure trove in a five-and-dime sort of way. Anyhoo, I will see y’all back here next Sunday, same Bat Time, same Bat Channel. Your old Uncle Rod is hoping the weather is changing for the better as spring comes in, muchachos. But it dang sure ain't yet. There’s a big Moon in the sky, and the clouds are still hanging in—usually the suckers taunt me by clearing out for the full Moon. Lunar eclipse? Fuhgeddaboutit. Not only was there not a single break in the overcast Monday night, it rained torrentially. I haven’t been able to continue my Destination Moon lunar imaging program. Much less shoot Mars. Or even do the spectra of a bright star or three with RSpec. Your first look at a deep sky object is usually memorable—if not always in a good way. There are those fuzzies that disappoint badly, like M101 disappointed me the first time I saw it—or, more properly, didn’t see it—in my Palomar Junior. Then there are those that blow you freaking away on night one, the M13s and M42s. Most, however, fall into category three: “Yeah…OK…that’s it?” In other words, not great, not bad. There, but Just OK. Like the Whirlpool Galaxy, Messier 51, in a light polluted sky. As I’ve told y’all before, my favorite activity when I was a proto-amateur, a ten-year-old kid wishing and hoping for a telescope, was mooning over deep sky pictures in the few “space books” I owned, Stars and a one or two others. The few in the Kate Sheppard Elementary School library. The even fewer in the bookmobile that pulled up at the filling station down the road every other week. My fave, or course, was M101, the Pinwheel. 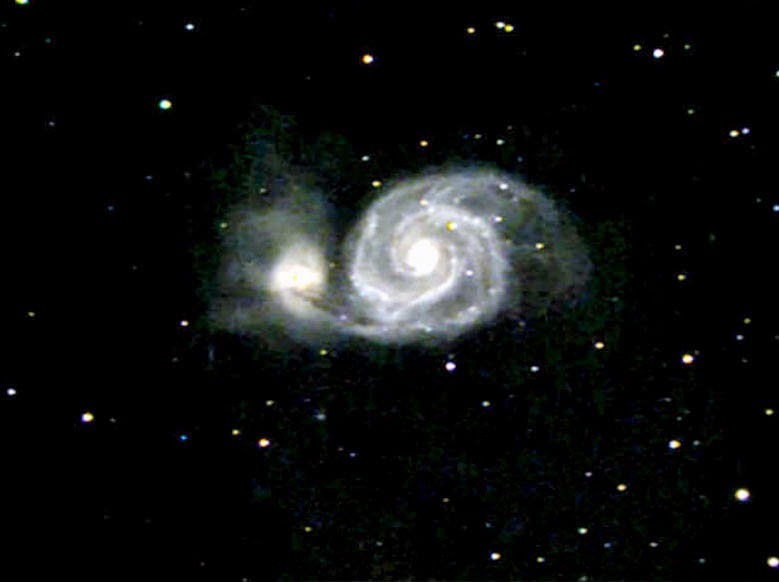 A close second, howsomeever, and maybe actually prettier, was M51, the Whirlpool. While M101 looked a little more like what little Rod thought a galaxy should look like, M51 had a small companion galaxy, NGC 5195, and the Whirlpool’s spiral arms, I thought, looked more even distinct than the Pinwheel’s—in pictures, anyhow. It was a good thing I’d failed at hunting for M101 with my Palomar Junior before I went after M51. That lessened my shock and disappointment considerably. Before we get to how the Whirlpool Galaxy looked in my humble scope’s 1-inch Kellner and ½-inch Ramsden eyepieces (no silly little millimeters for us back then), though, let’s get the skinny, the stats, the straight poop on this great galaxy. M51 is one of those Messiers that were actually discovered by ol’ Chuck himself. Charles Messier, out hunting comets one cool Paris evening in October of 1773, ran across one of his prototypal “nebulae without stars” in the small constellation Canes Venatici. He noted this non-comet was very difficult to see in his 3.5-inch refractor. Not only did he have a hard time seeing the Whirlpool, he couldn’t see NGC 5195 at all. Discovering that fell to his BFF, Pierre Méchain, in March of 1781. Actually, Sir William Herschel’s son John had seen something beyond the round fuzz-balls other observers recorded when he observed M51 with one of his large telescopes. John couldn’t quite see what the hell was going on, however. His drawing shows M51’s center surrounded by a ring-like structure. It took Parsons a couple of tries before he was sure he was seeing a spiral pattern in the galaxy. Even with his massive 72-inch Dobsonian-style reflector at Birr Castle in Ireland. Maybe because he was in Ireland with its uncooperative skies. Or maybe because he had no way of knowing what he ought to be seeing. 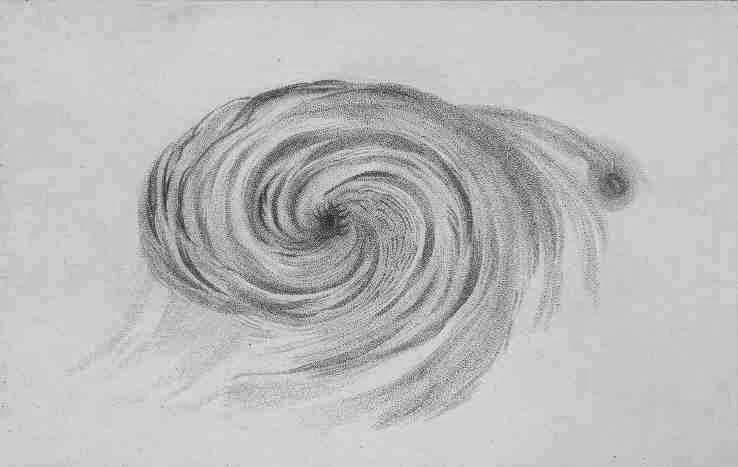 Anyhoo, on an exceptional April night in 1845, Parsons was able to observe the galaxy’s spiral arms, and subsequently made drawings and painting that don’t look much different from the sketches amateurs make today. After his observation, other astronomers began to see M51’s spiral with smaller instruments—once you know what’s there to see, it’s much easier to see it. Incidentally, Parsons apparently never referred to the galaxy as the “Whirlpool,” and it’s not clear who gave it that nickname. In the following decade or two, astronomers began to see spiral form in many dim nebulae, failed to resolve those nebulae into stars no matter how hard they tried, the term “spiral nebulae” was coined, and astronomy was set on the path to unlocking one of the big secrets of the cosmos. “That’s cool, Unk, but what’s the Whirlpool like in a scope? How big, how bright?” Well, Skeezix, M51 is a Hubble type Sbc near face on spiral galaxy. In other words, it is a spiral galaxy with arms that are neither tightly nor loosely wrapped, and which is oriented close to edge-on, so we get a nearly perfect view of its disk. While it is relatively bright at magnitude 8.7, it’s also relatively large at 9.8’ x 7.8’, so, as is the case with all face-on spirals, its light is badly spread out. How bad? Center a magnitude 9 star in your eyepiece and defocus until it’s 10’ across. That bad. It is, however, visible in a small telescope, even a Palomar Junior, even from light polluted suburban skies. What did M51 look like with the PJ from Mama and Daddy’s backyard in the 1960s? Or with a 6-inch Newtonian from a house not far from Possum Swamp’s shopping mall in the 1980s? Not much, friends, not much. But not bad either. It was not a complete failure like M101, at least. From any scope sited in light polluted skies, you can only expect so much. M51 is not overly hard to locate, but is not overly easy to find, either. Its position three-and-a-half degrees south of the “tail” star of Ursa Major (the last star in the Dipper’s handle) is not difficult to get on, but if you are not careful and don’t use a medium powered eyepiece to spread out the sky glow, you are liable to pass right over it. Especially if you are used to seeing the galaxy from dark locations or, like Unk when he was a sprout, know if only from its pretty pictures in books. You will be expecting something bright or at least something immediately obvious in the field. It may not be. It may be visible at 50x- 75x, but maybe not. You may have to play the balancing act with M51. Balancing act? Yep. The Whirlpool is large, about 10-minutes across. Actually, a little more than that when you include its buddy, NGC 5195. So, you’ll need an eyepiece field at least 20’ – 30’ in diameter to take in the whole object and leave plenty of dark space around it to provide contrast. You’ll also want an eyepiece that will provide high enough power—I like about 150X—to spread out and thin out the background sky glow. My fave M51 eyepiece used to be the venerable 12mm Type 2 Nagler when I went after the Whirlpool with a C8. The wonderful thing? You can get all the performance of a Nagler II today for far less than what I paid. Explore Scientific will sell you an 11mm 82-degree field eyepiece for freaking 172 dineros—considerably cheaper than the Nagler was in 1994. I’ve tried the ES 82s in the field, and while I’ve been spoiled by today’s 100-degree AFOV wonders, the ES 82 could be a real sweet M51 eyepiece. “What the frak did you see, Unk, what did you see?” On an average night in the city or deep suburbs with a 4, 6, or 8-inch, what I saw and still see is the same thing early observers saw, a pair of blobs, a double nebula, the bright centers of the two galaxies. That was at least something, and it didn’t threaten to crush little Rod’s spirit like his continual failure with M101 did. At least I was seeing the millions-of-light-years-away marvel that was the Whirlpool Galaxy, and my imagination could fill in the blanks. On the very best nights in the city, I can also make out a faint haze, a very faint nebulous haze, around the bigger blob that is M51, haze that represents the disk of the galaxy. 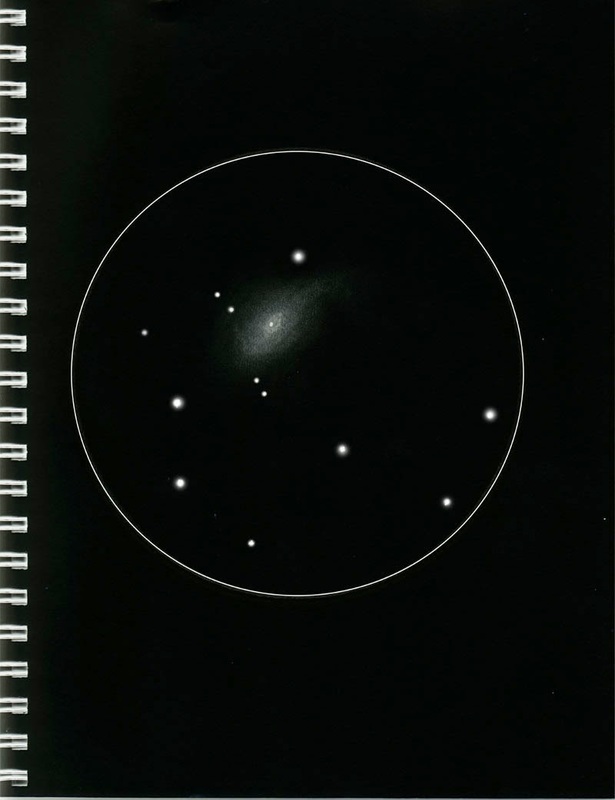 On one particularly cooperative early spring night when I was doing the observing for my book, The Urban Astronomer’s Guide, my 8-inch f/5 Synta Newtonian began to show the very vaguest hints of spiral structure. But it was not easy, not easy at all. It took at least half an hour of staring at the galaxy with a dark piece of cloth draped over my head to exclude ambient light before I could reliably see a trace of dark lane detail. Want to kick it up a notch? Get out of town. At least as far as what is called the “suburban – country transition zone,” which, twenty something years ago, was, for Unk, a spot near Hurley, Mississippi not far from the Alabama – Mississippi state line. That was the old Possum Swamp Astronomical Society Dark Site, and it was not too bad. Not till the dadgum gambling casinos were built along the Mississippi Gulf Coast and began shining spotlights and lasers up into the sky and burning millions of parking lot lights all night long. Me and my buddy Pat and one or two other PSAS stalwarts would gather at “Hurley” on dark Saturday nights for our deep sky runs. Just like today, Unk could be found out there on evenings when any sensible person would stay home due to weather. And, then as now, despite being younger and stronger and armed with a Walther PPK, I would get spooked by Mothman and The Little Grey Dudes from Zeta Reticuli when I was all by my lonesome. So what if it was cloudy? Maybe it would clear. This was a year or so before I met Miss Dorothy and, being recently divorced, I usually didn't have much else to do on a Saturday night anyway. I’d haul my homebrew 6-inch Newt to Hurley and hang out till it was obvious the clouds were there to stay or a twig snap caused by a passing possum (“WHAT WAS THAT?”) conjured up visions of the Deliverance Gang and Unk skedaddled. Sometimes, however, sometimes very, very occasionally, the weather gods would have mercy on not so old Unk, and throw him a bone. So it was one evening in the spring of ’93. I was between decent scopes, having sold my Super C8 Plus to finance the divorce. I hadn’t saved up enough for a new SCT, and didn't even have the 8-inch f/7 Coulter Odyssey yet, which would be the next scope down the line for me. The sky was suddenly and unexpectedly cloud-free and the imaginary baddies who’d begun to devil me had shambled and flapped off. What would I look at? I hadn’t had a good view of M51 since I’d moved back to the Gulf Coast from Arkansas, and the galaxy was now out of the Swamp’s light dome as the Dipper began to approach its “pouring out” stage. Truthfully, I didn't expect much. I wasn’t a very happy camper, having had to drop back from 8-inches to 6-inches, but I still knew the skill and perseverance of the person behind the eyepiece is what counts most, so I decided to give the Whirlpool the old college try. I’d like to tell you I was blown off my feet by M51, but I wasn’t and you won’t be either, not at a fair-good site with a small telescope. It was nothing like it had been with the Orange Tube C8 from the Ozarks. And yet…and yet…as I continued to stare, using a 12mm Vixen Orthoscopic and a 25mm Vixen Kellner, there were the spiral arms. They didn’t put my eye out, and I could not hold them steady, but they were there—once in a while. The nucleus of M51 was a small, and so was that of NGC 5195. What was not there? The “Bridge” of nebulosity that connects M51 and NGC 5195. That is the next stop on the road, the next goal of an M51 pilgrim. The Bridge, the trail of dust and gas NGC 5195 has pulled off its big compadre as it recedes into the distance, looks bright in images, but it is not. Not hardly. 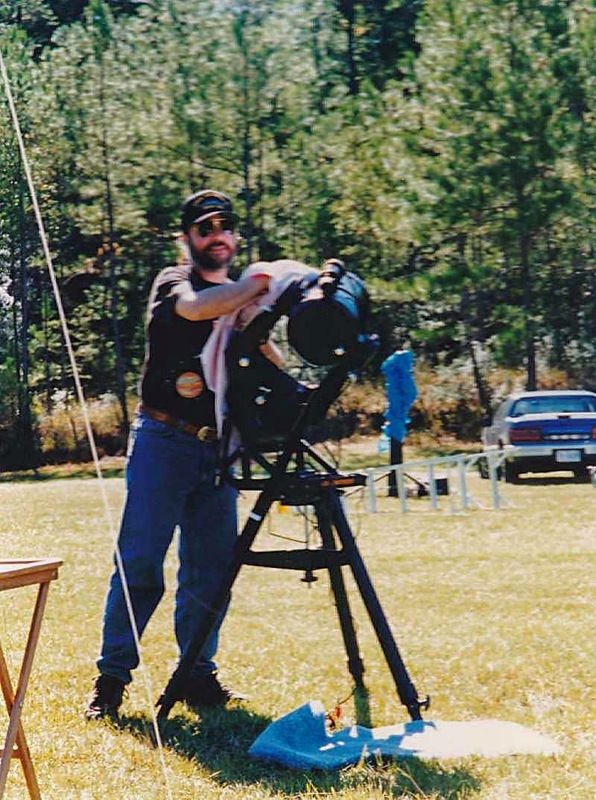 The only really good visual look I have had at it with any telescope other than Tom Clark’s 42-inch Beast was with my 12-inch Dobsonian, Old Betsy, when Miss Dorothy and I attended the 1999 Texas Star Party. 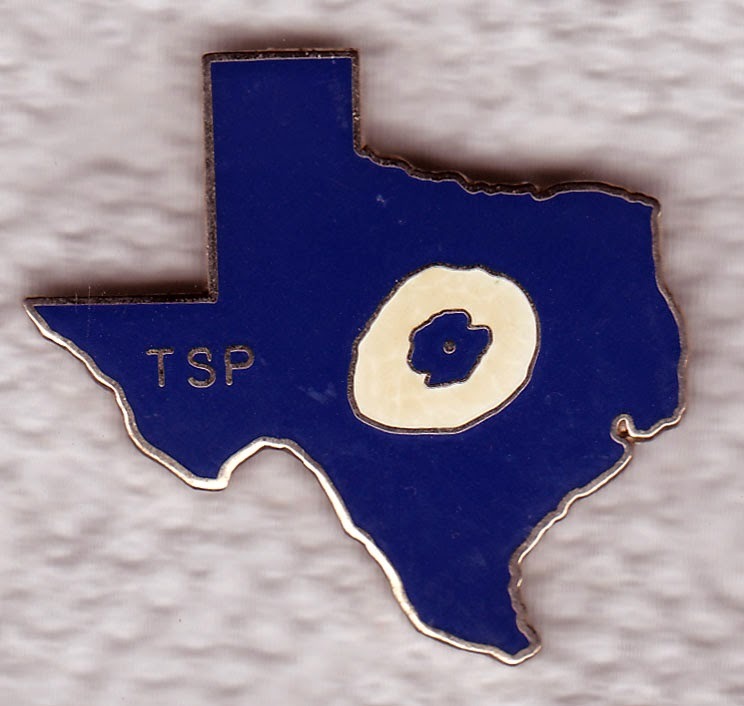 Despite its location way out west at Prude Ranch in the backyard of Macdonald Observatory, you cannot always count on clear skies for TSP. But you dang sure could in May of 1999. Not only was it clear, it was terribly dry—it hadn’t rained to speak of since the previous November. In my experience, “dry” helps almost as much as “dark” when you are chasing tough objects. First night of the star party, I had a long list of objects to work, TSP Observing Program Guru John Wagoner’s The Planetary Party. A tough list of umpteen planetary nebulae. I knew I needed to get started on it right away if I was gonna get my pin by the end of the event, but I couldn’t. Not for about an hour after astronomical twilight finally arrived, anyhow. M51 hooked me. It did blow me off its feet this time, in a way like it never has since. It bounded into the field of the 12mm Nagler, and the more I looked, the more I saw. The nucleus was a tiny, burning point smack in the middle of the galaxy’s round, bright center. Not only was the spiral structure easily visible, the arms were, I could finally see, not smooth, but uneven, curdled-looking along their edges. There were countless clumps of dark and bright material along their lengths. The big surprise? And not necessarily a good one? I could see the bridge, including with direct vision, but it was not that easy, not even in a 12-inch from Prude Ranch, which should give you some idea of the challenge it is from east of the Mississip. If you can see the connecting arm between M51 and NGC 5195 from your club site, even if it takes a big gun, a 20-inch or larger scope to do it, give yourself a big pat on the back. What’s the next shrine on the M51 pilgrimage? More details in the two galaxies, like HII regions, and, especially, the tiny galaxies like IC 4278 littered across the field. Some of these far distant sprites, including the Magnitude 14 range 4278, are in range of bigdobs, but with lots of ‘em, like pretty little edge on IC 4277, which is northeast of NGC 5195, you have entered the realm of “very small and very dim,” and it’s time to replace your eye with a camera. You’d a-thought I’d have tried to take an astrophoto of the Whirlpool at least once in the course of the many astro-imaging bouts that afflicted me between 1966 and 2005, but I never had. Given my questionable astrophotography skills and decided lack of patience, I guess I figured it would be too hard. Which is ironic, since M51 is actually one of the easiest galaxies to image. For the camera of a fast focal ratio scope, the galaxy and its fellow traveler are extremely bright and, most of all, photogenic, with those lovely spiral arms, the interacting companion, and the wee galaxies scattered across the frame. I was still skeptical, though, when I finally buckled down and learned to CCD. As you-all know if you’ve read my tales of my imaging misadventures here, my initial CCD camera, an MX516 from Starlight Xpress, turned out to be a big bust and soured me on electronic deep sky imaging for dang near three years. Till one day the good folks at Anacortes Telescope and Wild Bird (the proprietors of Astromart) emailed me with the news that Meade had come out with a new and inexpensive color CCD camera that would be a game changer. Would I like them to reserve a DSI for me? Yep, I reckoned I would. I knew I needed to learn the art of computerized astrophotography, and at the DSI’s reasonable price of about 300 bucks I figured I could afford to give it another try. The DSI was not without its faults. The program you ran it with, “Envisage,” sure was full featured—it would do everything but cook the grits in the morning—but its rather counter-intuitive user interface made it a nightmare for some folks. Also, the camera’s sensor, a one-shot color 1/3-inch Sony chip, was small and could make goto accuracy and guiding critical. Not knowing too much about the CCD game despite having played with the MX516 for a while, I didn’t realize I ought to be skeered because of the above, and wasn’t. After a night of playing with the DSI at the PSAS’ old in-town observing site, I got the camera to work and work like crazy. The software took a while to master, but it could be mastered, and it had some real good features—like the ability to take short subframes and stack them into a final image in real time. How about goto and guiding? Goto wasn’t much of a problem. My new CG5 mount was pretty good, even though it was still on the original iteration of the Celestron GEM software in 2005 and lacked the calibration stars that would later make the mount’s goto deadly accurate. When the CG5 missed putting a DSO on the DSI’s chip, I just used “Precise Goto.” The mount would slew to a bright star near the target, I’d center that on the laptop screen, and the CG5 would then move on to its final destination, invariably putting the DSO in the field of the DSI. What also helped was the Meade f/3.3 reducer I screwed onto the C8’s rear port. At that focal ratio, the field of the camera was just about right for most DSOs, and exposures were gratifyingly short. 20 or 30 stacked 30-second subframes made for a reasonably dense, reasonably noise-free picture. Guiding? We didn't need no stinking guiding. Unguided 30-second exposures were usually good. If the stars weren't always round, they were close to it. What followed was real cool, y’all. 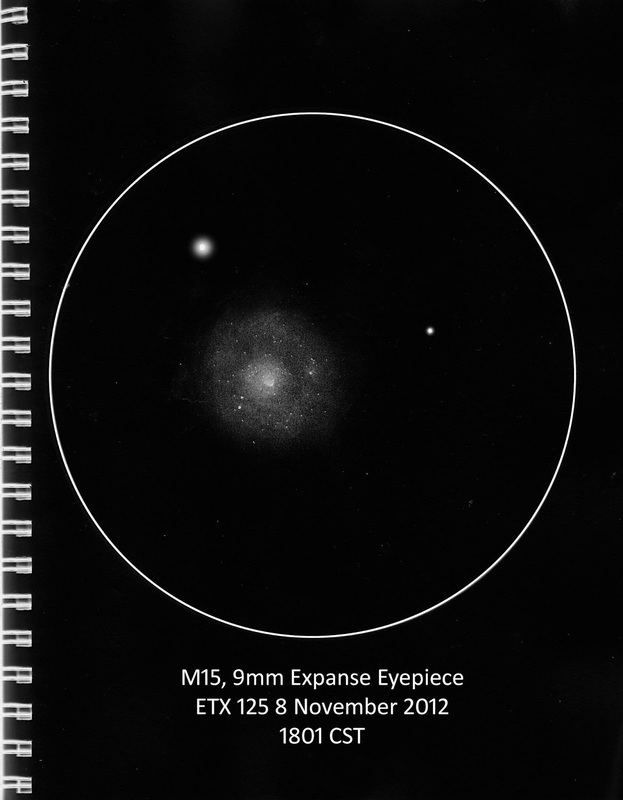 As I watched, Envisage took subframes of M51, stacking those that met its quality criteria. Slowly, an image of the Whirlpool began to build up on my monitor, until, after about half an hour, I had a picture that made my jaw drop. No, my shot of the Whirlpool from that night ain’t worthy of a Jason Ware or a Bob Gendler—not even close. 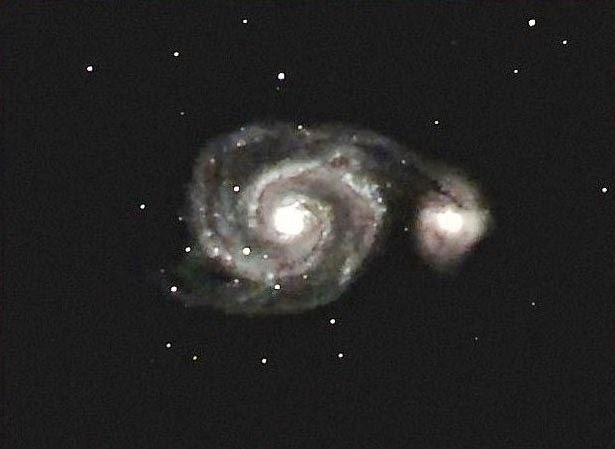 The uncooled camera was understandably noisy, and my processing skills were nonexistent, but that M51 was mine. I took it with my CCD camera. It was in color. It showed all kinds of spiral detail. The Bridge was crazy visible. The faint fingers of nebulosity extending from NGC 5195 were there, and I could even see a couple of them little field galaxies. I’ve since moved on to far more sophisticated cameras. My SBIG can blow the doors off the humble DSI with its more sensitive and larger monochrome chip. My Mallincams can do about what the DSI could do in half an hour in thirty seconds. I still love that DSI, though, and I still have it. It got me over the CCD imaging hump, and I’ve a mind to drag it out again and do a little picture taking with it this spring and summer, if just for old times’ sake. Messier 51? It is different from my everyday wonders like M42 and M13 in that I’ve had to work at it over the years to get it to give up its secrets. But it has, muchachos, it has, and it’s been fun unlocking those secrets. It’s a wonder, but a subtle wonder, and sometimes that is the best kind. As in, “How do you keep out of it?” One thing’s sure: there is plenty of telescope trouble to go around, muchachos. Why? 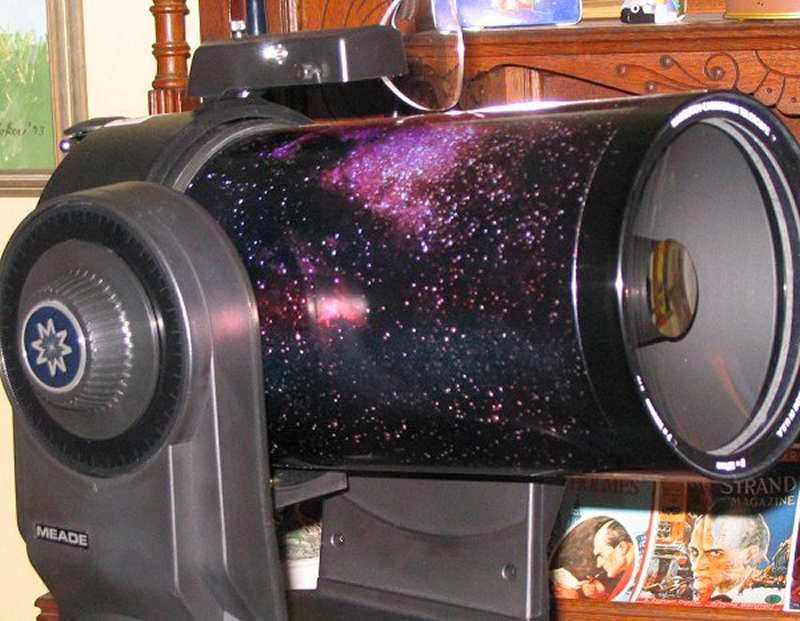 When us amateur astronomers go out to buy a new telescope today, what we expect is a one that’s got all the latest computer frills, is dirt cheap, works perfectly out of the box, and continues to work that way for a long time. These things are not necessarily mutually exclusive, but they can be, oh, they can be. In these latter days, it’s easy to buy an inexpensive telescope (relatively speaking) with every computerized gimcrack imaginable. The problem, sometimes, is getting one that works right. Our market, the worldwide market for amateur grade scopes, is small, so the companies who sell to us are small. Being small and charging low prices for gear means a company’s ability to perfect the designs of complex electronic systems and adequately QA those systems may be limited. There are small outfits, like Astro-Physics and Takahashi, for example, that will sell you a scope or mount of the very highest quality. You will have to forget “inexpensive,” though. If you are a cheapskate like your old Uncle Rod and buy from Celestron and Meade and the other Fords and Chevys, of the astro biz? You have to be prepared for a telescope or mount that is not perfect out of the box. Or even one that arrives DOA. There are ways to lessen those hairline reducing experiences though. You do that by following a few simple “rules,” the first of which is, “Don’t be an Early Adopter.” Given the nature of the astronomy marketplace, that’s the worst thing you can be. 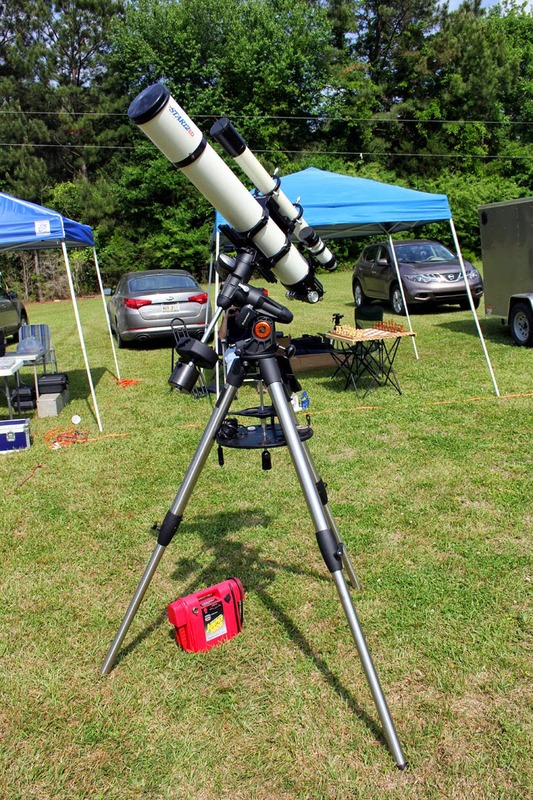 Ask the folks who sprang for the fraking Meade LX80. That mount, a take on the side-by-side style alt-azimuth mounts marketed by iOptron for some years, the Mini-Towers and their kin, sounded like the kitten’s meow. Here was a mount that would offer sophisticated goto via the AUDIOstar (not Autostar) HC. The damn thing would talk to you. Didn't want to bother with an equatorial alignment for visual use? Set it up as an alt-azimuth mount. Want to do imaging? Back to EQ mode you went. Frankly, Unk was impressed by the LX80’s specs and pictures. Especially given the announced less-than-1K price. Not only did the mount sound good, it looked good. Beautiful stainless steel tripod. A mount head that wasn’t just attractive, but appeared heavy on the metal and light on the plastic. Oh, and it could support TWO scopes in alt-azimuth mode side by side with a payload of up to 70 pounds. For equatorial work? Up to 40 pounds, same as the time-honored Synta/SkyWatcher Atlas EQ-6. Did I rush out and buy one? Hell no. In addition to his ingrained horror at being one of them early adopters, another of Unk’s rules dissuaded him: “If’n it Sounds too Good to be True, it Probably is.” Before you let something like the LX80 hook you, think about it. In this case, what I ruminated on was the question of what a mount with this much capacity, a goto controller, periodic error correction, and all the LX80’s many other features should cost? The answer I came up with by comparing it to similar rigs on the market was was “more than 2,000 bucks” (the price of the Synta AZ-EQ-6). Yet Meade was offering the 80 for little more than a third of that, about 800 dollars. Occasionally these sorts of things do pan out, no matter how sketchy they appear. I remember when Meade announced the LX90. An 8-inch SCT with full goto for considerably less than the then-current LX200 Classic cost. Unk was way skeptical, but I was wrong. 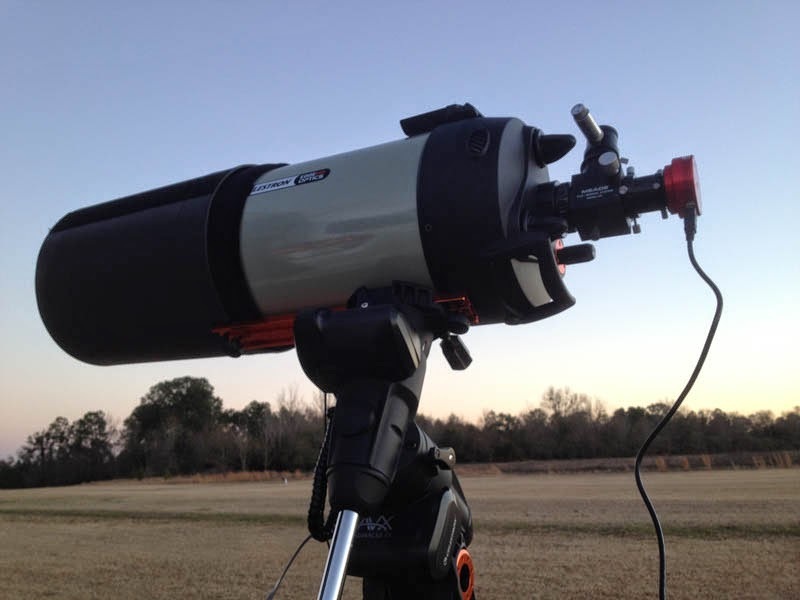 The LX90 was a wonderful scope and a resounding success, and I was hoping the LX80 would be too. I wasn’t willing to bet 800 bucks on it, but I was hoping. The sister to the above two rules is “Don’t Buy from a Company in Financial Trouble.” This is at least as important as “Don’t be an Early Adopter.” Maybe even moreso. If you get a scope or mount not ready for primetime, you can usually expect its problems to be fixed (eventually) by a solvent company with some resources. An outfit on the rocks? Not hardly. Dang sure don’t depend on bankruptcy laws to get the bugs out of your hand control software. Meade had been in trouble for some years before the LX80 debacle. Too late, they’d decided it was too expensive to make telescopes in California anymore, and belatedly moved production to China and Mexico. Meade’s problems were apparent to me by 2006, the year their revolutionary new SCT, the RCX400, hit the market with a resounding thud. That same year, I got to experience the company’s QA decline firsthand. Given the condition of my new ETX125 was in when it arrived, Meade’s QA program had gone straight to Hades. Some of my ETX’s faux pas were cosmetic. A little girl at the Chinese factory had stuck the Meade label on the tripod on upside down. The RA setting circle had been glued firmly in place and was incapable of being calibrated. Neither of these things was a big deal, but the ETX125PE hadn’t come cheap, and Unk was a trifle miffed. What really surprised me was that the ETX optical tube, usually flawless since the little scopes hit the street back in the 1990s, had a severe problem. I noted bad reflections any time a bright object was in the field. Checking revealed the scope’s eyepiece tube had not been screwed-in properly; it was cross-threaded into the scope’s back and canted at an angle. I was able to fix it with a strap wrench and a few minutes of my time, but I was shocked that it had got out of the factory in this condition. “But Uncle Rod, how do I know if a company is on its last legs, or what the hell it’s doing?” Don’t isolate yourself. If you are reading this, I assume you are into the Internet side of amateur astronomy. If not, make it a point to take a stroll through the Cloudy Nights forums, Astromart’s forums, and the Astronomy Forum once in a while. You can’t believe ever’thing you read in those places, of course, but if the consensus of the BBS' inmates is “Acme Telescopes is about to have a meltdown,” you ought to be cautious before buying from that company. REAL cautious. Which bring us to what the early adopters of the LX80 from the failing Meade encountered. 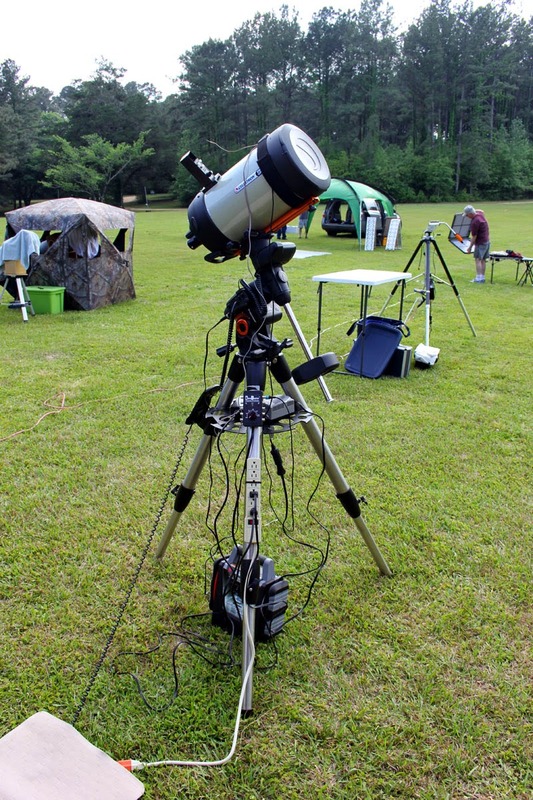 My buddy, Jack Huerkamp, decided to take a chance, so I was able to try his not quite stock 80 at the 2012 Deep South Regional Star Gaze not long after mounts began to flow to customers. To say the least, I was not impressed. Even in alt-azimuth mode with a 20-pound load, it was far from stable. 70-pounds as Meade claimed? It didn't have a dog’s chance in hell of doing that. It was very shaky with just Jack’s 9.25-inch SCT; at least in part due to a poorly designed spring-loaded gear system that caused the scope to bounce. Equatorial mode? Even less steady than alt-azimuth. Oh, and the computer locked up on us on the second evening. Jack wisely returned the thing. It was pretty bad, and it wasn’t even a stock mount. We had already heard of several cases of that good-looking tripod’s cheaply cast head cracking, breaking, and sending scopes crashing to the ground. Jack had a machinist fabricate a replacement head. At least Jack’s telescope didn't fall off the mount, but that was all the good that could be said about his LX80. So…the LX80 was not ready for prime time when it was released. It was starkly under priced for what it was advertised to do. When it (immediately) showed design problems, Meade no longer had the resources to fix it. If you hewed to the first three rules, you’d have chosen not to buy and would have saved yourself mucho heartburn. “Beware a Company that’s Introduced too Many New and Complex Products at Once.” That hurt the LX80 and the other new rig Meade introduced concurrently with it, the LX800 GEM, almost as much as the company’s financial difficulties. Their resources were stretched way too thin to support both new rigs, and probably would have been even in Meade’s salad days. The LX80 was bad enough, but the expensive LX800 was worse. It didn't work at all. In their defense, Meade recalled all the 800s, fixed the problems, and re-released the mounts/scopes at the LX850 series—which seems impressive now. That didn't help the LX80 owners, of course. While their mounts worked, sort of, they did not live up to the specs Meade released for them (and still has posted). Not even close. I hope Meade’s new Chinese owners, who picked up the pieces late last year, do something to help these folks, but they haven’t yet. 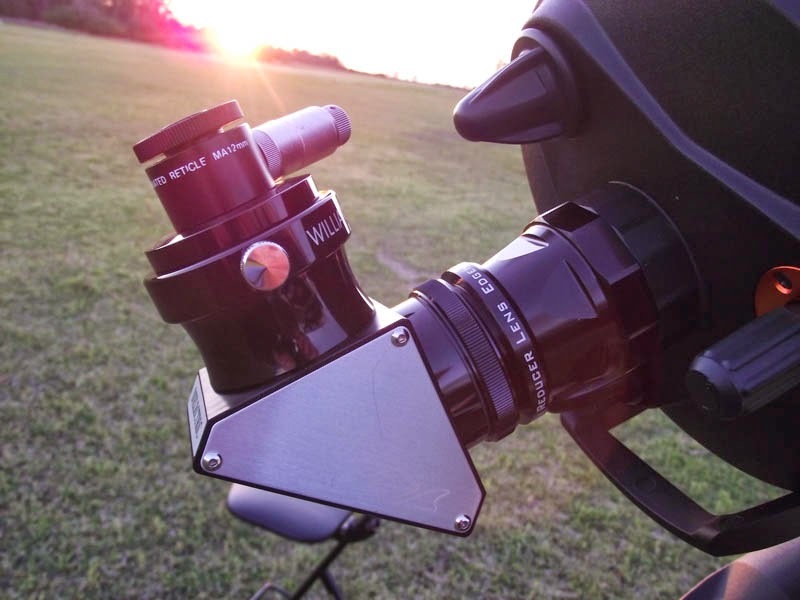 “Don’t Assume a Simple Non-computerized Telescope Mount Won’t Have Problems.” So, only Meade can do wrong? Not hardly. Let’s talk Celestron now. My VX GEM is fairly sophisticated electronically given its NexStar goto system. That was not what brought down the first mount I received, however. As I wrote here, a mis-threaded bolt-hole did it in. That is the just sort of thing we can expect with inexpensive, minimally QAed gear. Minimalist QA can affect anything, not just circuit boards. What can you do about it? Thoroughly test a new scope or mount IMMEDIATELY after you receive it, even if that means you have to play with it inside as the rain pours outside (natch). You are not an early adopter. You waited to put a toe in the water. That was me when I bought my Celestron NexStar 11 GPS mount in 2002, well over a year after the NS11 hit the street. “Don’t Assume a Scope that’s Been in Production for a While Can’t Have Design Problems.” Turned out there was a bug in the firmware of the NS11 that caused a “jump” in tracking when the scope was pointed west. Celestron fixed it, but it took replacing the motor control board to do that. Even if a telescope has been made for years and years, changes in production and electronic design can bite you. Take the Meade LX90 that I gushed about above. It had been made for about ten years and was one of the company’s most problem-free scopes when my friend Mike Weasner bought one. Alas, like my NS11, it suffered from a jumping drive. The fix was not as simple as it was for the Celestron, however, and Mike swapped the scope out for multiple LX90s in an effort to get one that worked right. He eventually wound up with an LX200 GPS instead. Meade fixed the 90, but it took quite a while. Part of the problem was the disruption caused by the move of production to Mexico. Mostly, however, the 90's woes were caused by electronic changes designed to simplify the scope and add new features. Most companies do that as time rolls on. Simplifying is usually a good thing, but not always. Changes of any sort put out the welcome mat for Mr. Bug, and just about everything in our scopes' drives these days is dependent on the proper functioning of computer code. What can you do about it? Again, test thoroughly. Test all the scope’s modes and features, including EQ tracking with a fork mount SCT if you have access to a wedge. As above, keep your ear to the ground on the Internet. Almost every scope/mount has a Yahoogroup devoted to it, and new problems will show up there in a right quick hurry. No, you can’t always take one or two problem reports seriously—the people who had trouble programming their VCRs have an even harder time with goto scopes—but a bunch of complaints don’t just equal smoke, it means FIRE. Meade and Celestron, even in their new Chinese-owned guises, are relatively small outfits, but you can go even smaller in amateur astronomy. To one-man garage operations. Some of these, like Shoestring Astronomy and Sky Engineering, and quite a few others, are resounding, reliable successes that have been around a long time and are obviously in it for the long haul. While good small manufacturers like these are not the exception in astronomy, neither are they the rule. Amateur astronomy's tiny businesses offer products that range from amazingly good to amazingly horrible. You can’t always get a good read on the quality of their equipment, either. Often, too little of it is out there for that, and, naturally, the reviews posted on the sellers’ websites are always glowing. Which brings us to, “Buying from a Small and Unknown Manufacturer is Always a Roll of the Dice.” My friend Pat found that out when he ordered an equatorial platform kit from a one-man operation. If you are interested hearing about the whole, sordid affair, you can read the details here. I hope the seller has improved his product in the intervening years. Since he is still around, I presume he has, but in 1999 his platform did not work. It sucked, in fact. It didn't work with an 8-inch scope, much less the 12-inch it was advertised for. What was worse? His response when Pat asked for a refund after weeks of fiddling with the thing, “I don’t have a return policy.” In other words NO REFUNDS. Sometimes you find gold in them thar garages, but experiences like Pat’s are always a possibility. In retrospect he and Uncle Rod (who was highly complicit in the buy) should have been more cautious. “Don’t Wait too Long to Get a Problem Resolved.” Like I did with my Celestron Ultima C8, Celeste. On First Light Night, the very evening after I received my beautiful new SCT, a problem cropped up. I was happily observing with my new baby in the backyard when the drivebase let out a whine and the scope began a high-speed slew in R.A. that didn't stop till I cycled the power. Was I disturbed? You are dang right I was, but I procrastinated. I was in denial. What I shoulda done the next morning was call the vendor I bought the scope from, tell them about the problem, and insist on an immediate exchange. Instead, I waited, and waited. In my defense, 1995 had a right cloudy spring and summer. 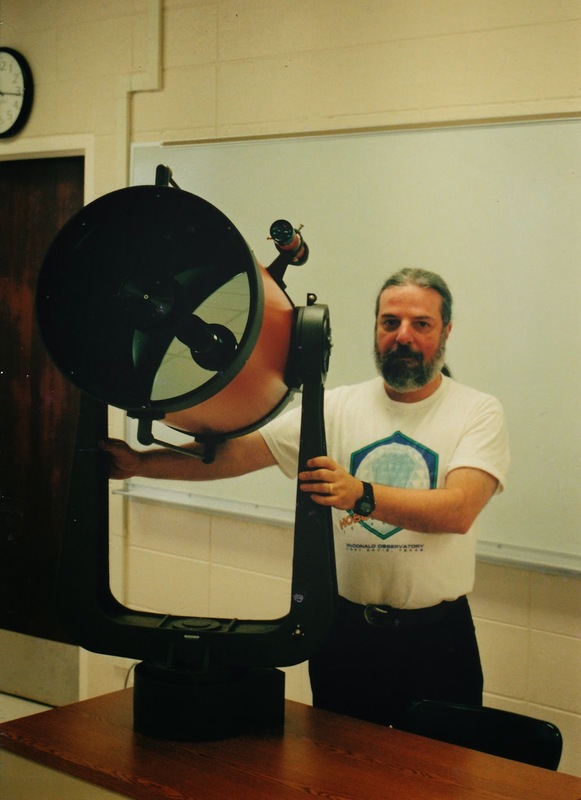 I was only able to get the Ultima 8 out once in next couple of weeks, to the Mid South Star Gaze. The problem didn't recur there, so I thought I was OK. Unfortunately, the reason it didn't come back was because it didn't have time to come back, given the pitifully few hours of observing we got. Nevertheless, I assumed the First Light malfunction had been a fluke. You know what they say about the word “assume,” doncha? At the 1995 Deep South Regional Star Gaze the following autumn, the R.A. runaway came back with a vengeance, spoiling most of the last and best night of the star party. The good thing was that the telescope was still under warranty—with about five months to run—but a warranty repair meant I had to pay to ship the drivebase back to California, and was without a working scope for weeks. I should have set up the Ultima 8 in the living room the morning after First Light, turned it on, and let it track for an extended period to see if the problem came back (it would have). I didn't and paid the price. A Corollary to the above rule is, “Never Call the Manufacturer if you have a DOA Telescope; Call the Seller.” If you bought a new TV at the cotton-picking BestBuy, brought it home, turned it on, and it didn't work, you wouldn’t ship it back to Panasonic for repair, now would you? Nope. You‘d take it right back to the store for a refund or replacement. That is exactly what you should do with a telescope that's bad out of the box, too. If you do call the manufacturer, what will happen? They will likely have you ship the scope to them for repair. Shipping will be on their dime, but you will be without the new scope for weeks—or even months. So don’t do that. Most of our dealers today are outstanding. I’ve worked with Skies Unlimited, Astronomics, Anacortes, OPT and quite a few others over the last twenty years and have always been made happy. They will help you with a bum scope like my dealer, Bob Black at Skies Unlimited, helped me with my faulty VX. A good dealer will (and should) deal with the manufacturer for you if they need to be brought into the discussion. Some folks ask me if having the manufacturer repair a new telescope or mount might not still be a good idea if the dealer doesn't have another one in stock and it would take weeks to get a replacement. That’s for you to decide, but I advise you to get an exchange from the dealer. You paid for a working scope, not one that has been repaired. And it will likely take just as long for the maker to fix it as it will for the dealer to get another one. Not all Troubles are brought on by the depredations of telescope makers, y’all. We create some of them for ourselves. 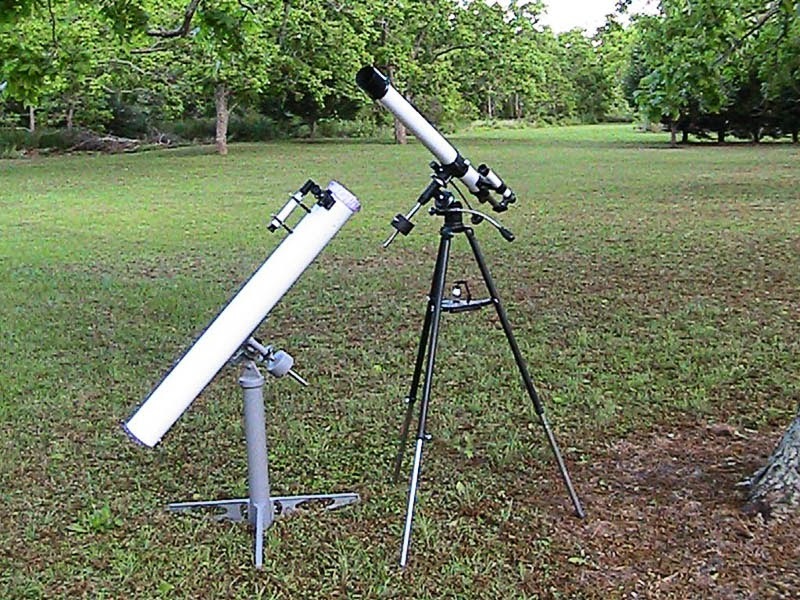 I like small APO refractors. Hell, I’ve got a couple of ‘em. They are great for wide-field imaging, but there is a limit to what they can do visually, and most won’t satisfy you long as a primary instrument. Unfortunately, lots of newbies get to reading the refractor forums in places like the Cloudy Nights BBS and convince themselves that pretty 80mm APO, since it has “perfect” optics and is so expensive, will be all they will ever need. If only ‘twere so. Once Janie Novice moves past oohing an ahhing over the Moon and Saturn, and especially after she gets a few looks through a fellow astronomy club member’s plebeian 8-inch Dobsonian (which cost a third what her 3-inch did), she’ll be an unhappy camper. 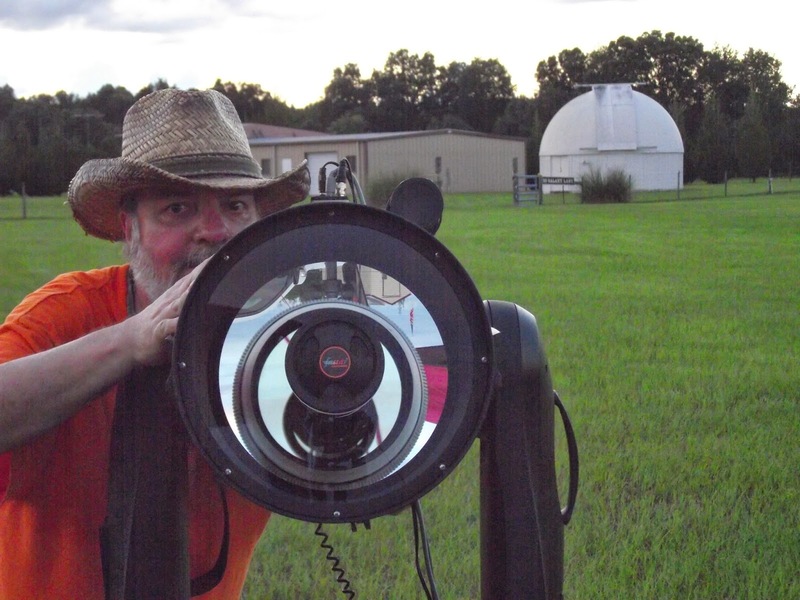 Let’s face it, a 3-inch—or four inch or five inch—telescope is, well, a three-inch telescope. Even if perfectly made, the merciless laws of physics, those cold equations, won’t allow it to show as much as the dirt-cheap 8-inch Dobbie. Whether you are a novice or an old hand, also beware of the other misstep plenty of us make. “Don’t Buy a Telescope That is Too Much.” This especially afflicts novices with a nice pocketful of change to spend on the first scope. “Man, Cousin Bubba’s C8 sure shows lots, but a 12-inch must be even better.” And it may be—if you have a permanent observatory or can at least wheel it outside on wheely bars. Otherwise? Not so much. At first, you might use the big gun frequently, horsing it into the backyard even for half hour looks at the Moon. Inevitably, though, you will begin finding excuses why you just can’t observe tonight: “Man, I’d like to get out with the scope, but the season premiere of Mountain Monsters is on the dadgum cable TV.” And nothing is sadder than the newbie who arrives at the dark site with his/her huge and complicated scope (of any design), and finally gets it put together and working just as everybody else is leaving at the end of the night. Big scopes are fun, but most of us want a more “reasonable” one for much of our observing. Since, I have not been able to observe from my backyard for years due to its tree-clogged sky, my C8 on a GEM gets far more sky-time than my fork mount C11. I enjoy the C11 when I do lug it out for special runs, but my bread and butter is the C8, which is just so easy to carry to the dark site, even for “iffy” evenings. Final advice? In the long run, you’ll be happier and more productive if you focus on the telescope you have, not the one you want next. I went for years constantly dreaming of the More Better Gooder. It sure was fun to drool over the magazine ads, but one day I got tired of it all (well sorta) and decided I wouldn’t move on to the next big thing till I’d wrung every ounce of performance out of what I had. Guess what, muchachos? I still haven’t exhausted the potential of my two decade old 8-inch telescope (I did buy that new Edge 800 SCT last year, but that was my RETIREMENT GIFT, y’all), much less my 12. My time tested scopes keep my bank account happy, and I don’t spend my days—and nights—worrying about dadgum Telescope Trouble. Uncle Rod ain’t no Michelangelo—or Donatello, Leonardo, or Raphael—but I’ve always enjoyed drawing, muchachos. Including drawing what I see with my telescopes. I started trying to sketch what was in my eyepiece not long after I got my first scope, a puny Tasco 3-inch Newtonian, way back in ‘65. Why? I wanted mementos, something to help me remember the amazing stuff I’d seen, and I sure wasn’t going to be capturing even bright stuff like the Orion Nebula with my Argus box camera. I could get some (sorta) OK moon pictures with the Tasco, but not the crater close-ups I longed for, and not a single deep sky object. Even after I got my first good scope, the vaunted Palomar Junior 4.25-inch Newtonian, I continued to draw. While the Pal could do somewhat better Moon pictures, the deep sky was still impossible without a clock drive. Plus, I suddenly found I enjoyed the process of putting pencil or charcoal to paper. Like most kids, I reckon, I‘d always liked to draw, but at first that went no further than the WAR PICTURES me and my mates in 4th grade liked to do when Miss Dixon gave us a little of that rare Free Time. You know, NAZIS on one side of the paper and GOOD GUYS on the other side having at it, stick figures against stick figures. 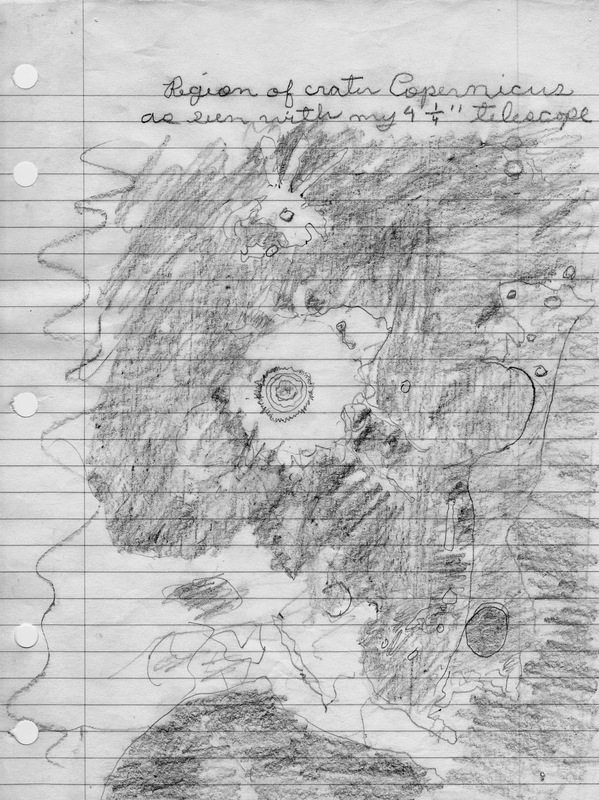 The astronomical drawing idea mostly had its genesis one bright sixth grade morning when our teacher, the ever-attractive Miss Stinson, came into the classroom bearing a big stack of 3 by 4-foot sheets of butcher paper. We were doing a Space Unit in Science, and our assignment, she said, was to draw maps of the Solar System. Me and my buddies, Wayne Lee and Jitter, agonized over that butcher paper for days, going way beyond the Sun and planets, adding cool stuff like asteroids and an Explorer satellite or three. All the fun we had doing that project planted a seed in me. What if I kept going? What if I drew the Solar System through my telescope? One night I began doing just that with a crude sketch of the mare on the face of the full Moon in the Tasco. When I got my Pal Junior, I zoomed in on craters and started my own lunar atlas (which I never quite finished) with Copernicus. The result wasn’t much, as you can see here, but I was thrilled and kept after it, going on to the deep sky after I did a lot of the Moon, Jupiter, Venus, and Saturn (I couldn’t see Mars’ features well enough to draw much). Not that I really knew what the hell I was doing. My art supplies consisted of sheets of ruled loose-leaf notebook paper, a number two pencil, and a Bic ballpoint pen. You don’t need a lot of fancy materials to draw the night sky, but you do need something better than a dadgum school pencil, and those early sketches would have been better if I’d had tools that were a smidge better. I didn't get those better tools till a couple of years after I began drawing, after John Gnagy told me what I needed. As I’ve said before, early adolescence was trying for me. One thing that was especially trying, silly as it sounds today, was figuring out what Santa in the form of Mama and Daddy should bring me. One especially difficult Christmas came when I was 14. I’d decided it was finally time to close the books on the wonderful Marx playsets and space toys that still inhabited the Sears catalog as the 1960s died. What then? I would for sure ask for the new Beatles album. And that boxed set of Robert Heinlein paperbacks I’d been admiring in Bookland in Possum Swamp’s new Mall. What else? That expensive Erfle eyepiece in Edmund Scientific’s catalog was still out of reach (24 impossible dollars). Idly thumbing the Sears Wishbook after my little brother had marked all the Captain Action and G.I. Joe figures he wanted—lucky kid—I drifted out of the toy department. Just past the books—I had finally outgrown Tom Swift Junior—were art supplies. What caught my eye was the John Gnagy Learn-to-Draw Sets. I vaguely remembered seeing Mr. Gnagy on the TV, a beatnik looking dude with a goatee who had a show where he supposedly taught you to draw. I didn't remember his show well, since it was only shown occasionally by the TV station where Daddy worked (when film for something else didn't arrive), but I knew Mr. Gnagy was a REAL ARTIST, and if he said he could learn me to draw, I believed him. Maybe, just maybe, I could improve my pitiful drawing skills to the point where my sketches of Jupiter looked like something other than a custard pie. Since I wasn’t getting a clock drive for the scope any time soon, it looked like I’d be drawing for quite a while yet. I circled one of the sets for Mama, the most expensive one, natch, which cost twelve big dollars. Christmas morning 1967, I didn't expect to find the big one under the tree, but there it was. I hadn’t asked for too much else, and maybe Mama sprang for the fancy one out of relief that I hadn’t asked for space toys—was her strange little son finally growing up? Anyhow, I was now fully equipped for drawing what I saw on the Earth and in the sky. Mr. Gnagy’s instruction book wasn’t perfect, but it was OK, and, supplemented by another basic book on drawing I got from Bellas Hess, our favored discount store in the late 60s, it got me started. 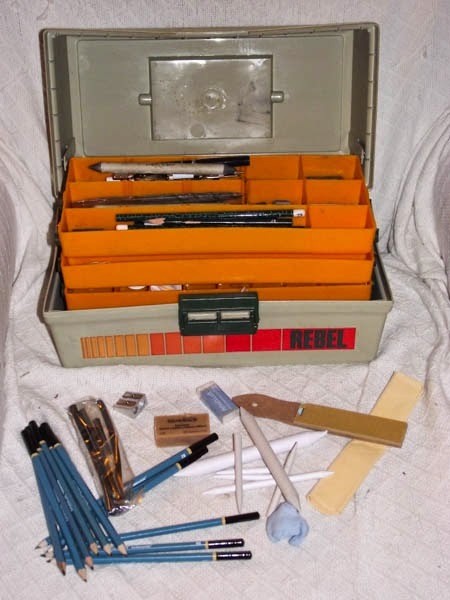 I kept and used my Learn-to-Draw set well into the 1970s, periodically replenishing its cardboard and vinyl case with fresh supplies I got from Bellas Hess’ surprisingly well stocked art department. bad at all if’n I do say so meself, as even practical minded Mama had to admit. The summer after that Christmas, she even arranged for me to take lessons at the Possum Swamp Art Museum. The class was taught by a pretty young woman who was a professor in the Art Department at the University. Naturally, I immediately developed a huge crush on her, but was able to pay enough attention to what she was saying, barely, to improve my skills. “Well, that’s cool and all, Unk, but I don’t want to draw no still lifes, just pea-picking M13.” The techniques you’ll use for Celestial artwork are a subset of those you’d use to draw terrestrial objects. Luckily, however, the skills you need to draw the sky are relatively few and most can be picked up by experience. A good book on basic drawing—your library will have plenty—might help, though. If you’re a-gonna draw, you have to have stuff to draw with and on. Most of all, you need pencils. Good drawing pencils from an art supply store. Pencils are rated “H,” “HB,” and “B,” depending on how hard their graphite is, ranging from “H,” hard, to “B,” soft. Like main sequence stars, they are further subdivided by numbers. “9H” is the hardest—good for making teeny-weenie stars, and is followed by “8H,” which is not quite as hard, and so on. “9B” is the softest, great for nebulosity. “HB” is between hard and soft, and is a general-purpose pencil equivalent to the good old Number 2 of your childhood. You’ll also need an eraser, not just for fixing mistakes, but also for drawing. When I want to indicate dark lanes in a nebula or galaxy, for example, I do that with an eraser. Which eraser? A “kneadable” eraser. Every art store has these things, which look like gray silly putty. They can be pulled and formed into any shape you want, including a sharp point suitable for fine work. As you continue to use the eraser, the gray silly putty stuff will become black as the eraser picks up more and more graphite particles. You can refresh it by kneading it, working on it like a piece of bread dough till it’s more gray than black again. Eventually, however, it will lose its erasing oomph and need to be replaced. Kneadable erasers are perfect for detail work, but are not good for erasing large areas. When you have to do that, you want an art gum eraser. These erasers, also easy to find, look like tan or blue blocks of rubbery stuff. Unlike rubber or vinyl erasers, an art gum will not damage paper. Sometimes I am drawing large regions of nebulosity, like when I undertake M42 or M8. That’s hard to do with even the softest B pencil, so I turn to charcoal. Charcoal for drawing is available in three main types, charcoal pencils, compressed charcoal, and vine charcoal. The latter, which comes in long sticks that can be broken into short pieces for easy shading, is my choice, since, unlike the other types, vine charcoal is easy to erase. One of my most used drawing tools, the stump or “tortillion,” is like an eraser in that it doesn’t draw lines. Nevertheless, it is probably my most used tool after pencils. Stumps are cylinders of rolled paper and come in various diameters with various shapes of tips. You use them to blend areas of pencil or charcoal, and they are essential for making smooth gradations in nebulosity and softening lines. You’ll want to keep your pencils sharp. A plain old pencil sharpener will work, but you should supplement that with a sandpaper block. That will put a good sharp point on a soft pencil when you need it. Just run the tip sideways across the sandpaper, turning frequently, to sharpen. You can get sandpaper blocks with various grades of sandpaper (medium is good) at the art supply store. A container to keep your drawing tools organized and in which to carry them to the dark site is essential. I have no doubt an art supply store will sell you a fancy box for a fancy price, but you don’t need that. If I still had the case from my John Gnagy set, I’d still be using it. Since I don’t, I use a cheap Rebel (natch) fishing tackle box I got at the cotton picking Wal-Mart. Works good. Finally, you gotta draw on something. There are countless different types of paper suitable for pencil/charcoal drawing. The good folks at the art supply shop can direct you. The consideration here is not just a paper that takes pencil and charcoal well, but a pad that is easy to use at the scope. I like something called a “sketch diary,” a spiral bound book of medium-weight drawing paper. Comfortable to hold at the eyepiece, and (the ones I buy) nice and white and good looking in computer scans. I reckon you can find similar sketchpads anywhere that sells art supplies, but I get mine at, of all places, the fraking Walgreens drugstore. Ok, so you’ve got stuff to draw with and on. How do you do it? How do you draw what you see in the eyepiece? I’ll tell you what works for me. Before I do that, though, we maybe ought to talk for a minute about the optimum scope for sketching. Any telescope will work, but in an ideal world, it would be nice to have a driven one that tracks the stars. Otherwise, you’ll get to feeling like a confused octopus, what with holding the sketchbook, drawing, looking through the eyepiece, and nudging the scope along all at the same time. I’ve drawn what I see in the eyepiece of my Dob, Old Betsy, for years, though, so it is hardly impossible. It just takes a little practice. Eyepieces? Just use your favorite ones. HOWSOMMEVER…if you, like your Old Unk, are blind as a bat and cross-eyed as a cat not just any ocular will do. If you need to wear glasses to be able to see your sketchpad and draw, you’ll want eyepieces with enough eye relief to let you see most of the field when you have your glasses on. I went through the “look in eyepiece-put readers on-draw-take readers off-put readers on again” routine for years and got real tired of that. Today, I’ve gone past reading glasses to real eyeglasses with progressive lenses. Using longer eye-relief eyepieces, I can leave my spectacles on both to observe and to draw. Hokay, let’s get started. Everybody has their own method that works for them, and you will develop one too, but this is what Unk does. At first, I don’t draw nuttin. I spend a considerable length of time just looking at the fuzzy, searching for details I will want to put in my sketch. This is probably the most important step, y’all. Having a good look not only helps with the drawing, it locks the object in my memory at least over the short term, helping me do a finished sketch the next morning. How do I see to draw? I’ve tried various red lights, including the flexible-neck clip-on book lights with red LEDs Astrogizmos used to sell at star parties. What works best, I’ve found, is a red LED headlamp I’ve dimmed down with nail polish. You want to be able to see what you are sketching, but you don’t want to ruin your night vision with too bright a red lamp. You also danged sure want the light to be hands free. When I’m finally ready to begin, I grab my sketch diary, which I’ve prepared with field circles drawn with a compass before leaving home . Your circles should be nice and big, five to six inches, at least. I’ll also grab my fine point black marker—not a pencil—for star drawing. You could use a pencil to draw in stars, but I prefer a marker for the brighter ones. I then begin marking the bright stars, looking through the eyepiece and drawing till they are all done. Try to place them accurately. Look for little asterisms, lines, triangles, etc. to help you. The brighter the star, the bigger the dot. If you are drawing an open or globular cluster, you will continue drawing stars after you’ve done the bright ones. I tend to switch to a hard, sharp pencil for the smallest, dimmest suns. That’s not really the question with a glob or an open cluster, though. The question is, “Do I really have to draw all them stars, Unk?” The answer is “no.” This is art, not photography. You just want to give an impression of what the cluster looked like to you, not precisely render every fraking star in M13. I will accurately draw and position the brighter stars of a globular, but I will just indicate the dim ones with an eye to capturing the look of the glob. Opens? I’ll do the same with a rich one like M37. With a looser cluster like M36, however, I will accurately depict almost all its stars. Hows about nebulae and galaxies? After I have drawn in the field stars, I’ll go on to nebulosity. Actually, I used to draw nebulosity in the field, but I rarely do so now. Instead, I just draw “contour lines.” I’ll draw the outline of a nebula and then, farther in toward the center, indicate where it begins to brighten with another outline. And the next level of brightness with another contour, and so on. I write plenty of notes on the drawing, too: “fainter here,” “brightens gradually here,” “core is much brighter” and so on. 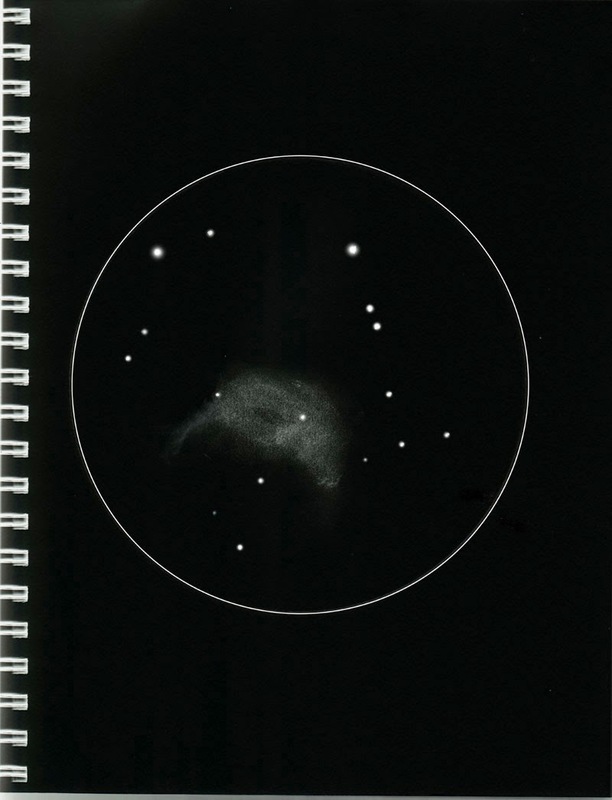 You can draw nebulosity at the scope if’n you like, but my method allows me to work faster and is more accurate than “real” drawing given my elderly eyes. And that is it. 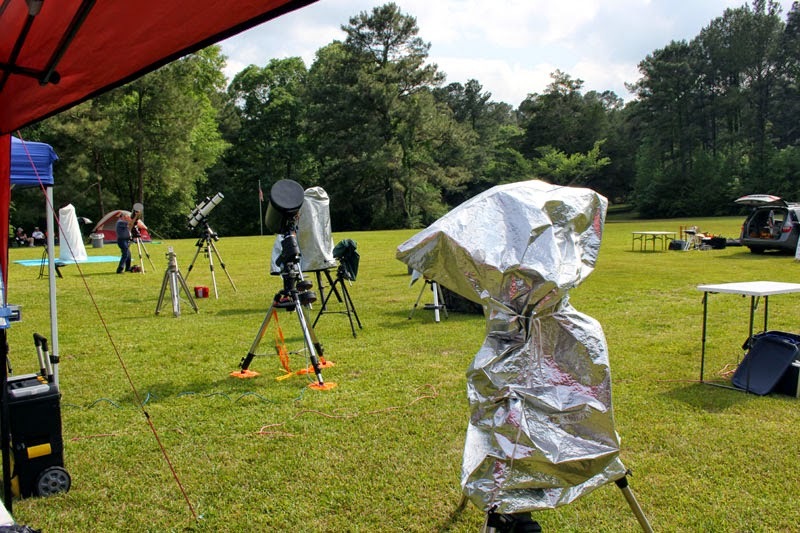 Take one last look at your picture and at the object—a good long look at the DSO—to make sure you haven’t missed any details. When you are convinced you are good to go, label the drawing with the object ID, date, time, scope, eyepiece, etc., and move on to the next faint fuzzy. Repeat as needed till you’ve got every object on your agenda done, or, like Unk, the call of a warm den and a bottle of Rebel Yell becomes irresistible. 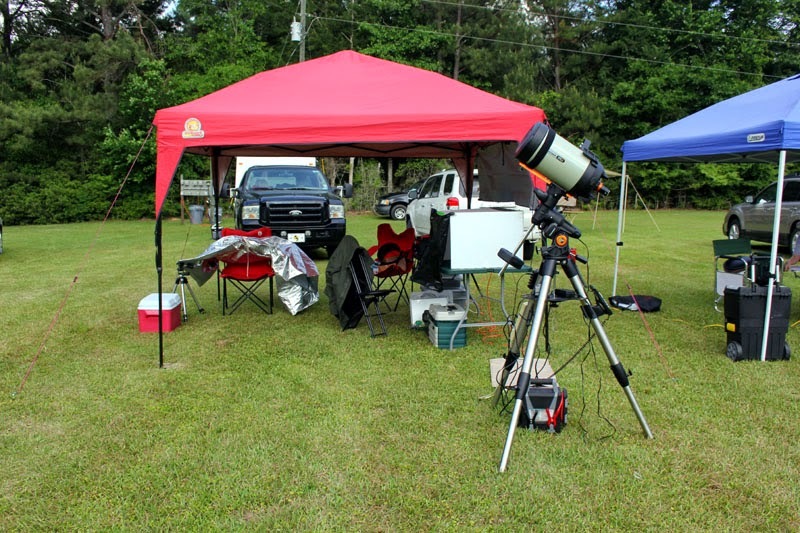 Which ain’t what happened last Saturday evening at the Possum Swamp Astronomical Society dark site. Given the rare (for spring down here) clear skies, I hit it hard and sketched nearly a dozen objects before haze began to kill the transparency. Why so many? I am working on a new book project (the Herschel Project book has been temporarily pushed into the background a little, but I am continuing to work on it). This new observing guide will have sketches for every one of its objects, and there will be a fair number of objects, so I have to do as many drawings as possible every single run. Anything else to say about Saturday night? It was nice to have some company for a change, five other folks for at least part of the evening. And I sure oughta heap more praise on the pea-picking Celestron VX mount. Like its predecessor, the CG5, the VX GEM is solid and reliable. I never have to worry about it; every object I request is always in the field, even with the C8 at f/10. I’ve even made friends with the mount’s dadgum Plus hand control. I bought an extension for its too short cord from Scopestuff.com, and, while I still don’t like the buttons and menu layout, I’m getting used to using the Plus. On nights when I don’t want to run NexRemote, it is OK.
What was more than OK was the f/7 reducer I used with my Edge 800 SCT, Mrs. Emma Peel. I said quite a bit about it some time back, and what I said was favorable, but let me reiterate: if you have an Edge 800, 1100, or 1400, you want one (there ain’t a Celestron reducer for the Edge 9.25 yet). It preserves the scope’s wonderful field edge while widening up that field. Hell, even my el cheapo 100-degree eyepiece, the 16mm Zhumell Happy Hand Grenade, does a good job at f/7 with the Celestron Edge reducer. Anyhoo, I viewed and drew a lot of cool stuff. What was the winner? Maybe the Thor’s Helmet Nebula, NGC 2359, in Canis Major. In the Happy Hand Grenade equipped with a 2-inch thousand Oaks OIII filter, the “helmet” area of this 10’ diameter cloud was as bright as I’ve ever seen it from the PSAS site. Even better, the “horns” were easy. Which put a nice cap on what had been, for once, a productive deep sky evening. Back home at the Old Manse, I headed straight for the dadgum liquor cabinet. I had the good sense not to even glance at my rough sketches,. They would have looked quite horrible by bright room light. Experience has shown my rough drawings will be more than adequate to help produce finished pictures by the light of day, but, still, it’s better to leave them alone till morning time. Next morning—I try to finish my drawings the very next day while I still remember exactly what the objects looked like—it’s time for Phase Two, cleaning up the drawings. What do I do? I rip the sucker right out of the sketch diary and turn to a new page. 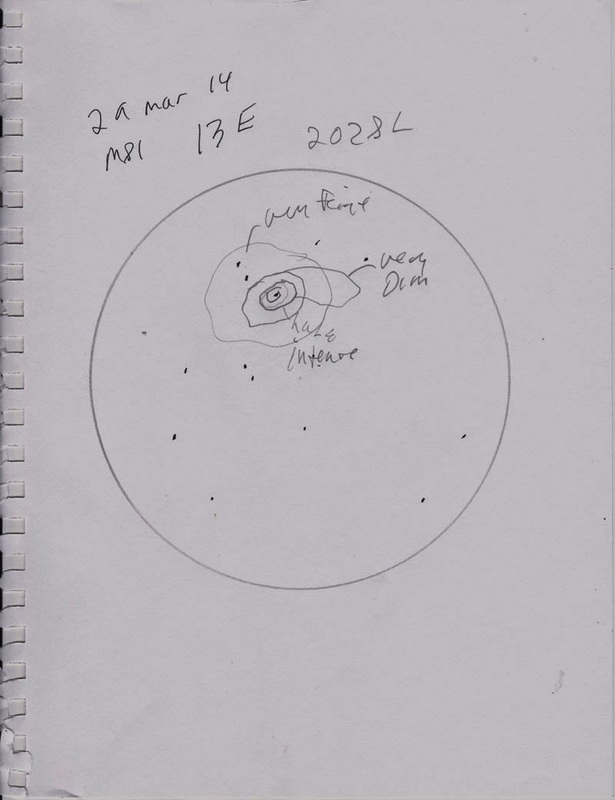 I use the marker to sketch the stars recorded on my rough drawing in a new field circle, keeping them maybe a little smaller than they were on the rough sketch. I take pains to duplicate their placement as closely as possible. 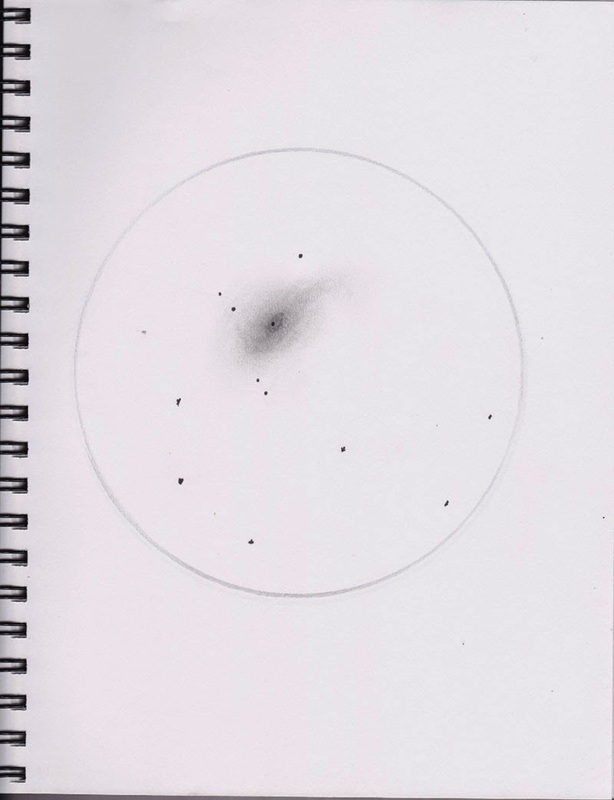 If the sketch is a star cluster, open or globular, I’ll proceed to draw the rest of its suns. As in the field, I’ll likely use a hard pencil to indicate the dimmer ones. Then comes the hard part, drawing nebulosity. I use my soft pencils, charcoals, and blending stump to do that, sometimes using slightly harder pencils to indicate brighter portions or the kneadable eraser to show voids and dark lanes (remember, your drawing is a negative image; black will become white and white black when you are done). I pay close attention to the contour lines on my rough drawing to help me correctly portray brighter and darker areas of nebulosity. And then I am done—with Phase Two, anyhow. These days, there is also a Phase 3. I scan the drawing into the computer, into Adobe Photoshop (that’s what I use, but any similar image processing/paint/drawing program, like Paint Shop Pro, will work). When the drawing is in Photoshop, the next thing I do is make a nice dark circle to overlay my pencil-drawn field circle. How you do that depends on your software. It’s easy with Photoshop using the Ellipse Marquee Tool. The rest of my work in Photoshop is mainly clean up, erasing any wayward pencil marks, smoothing and smudging nebulosity with Photoshop tools to hide pencil strokes (airbrush works great for that). Mostly what I do, however, is fix my stars. I cannot draw convincing stars with a pen or pencil, but Photoshop does ‘em easily. I use the Airbrush Tool, setting Opacity to 100%, Flow to 40 - 50%, and Size to a size just a smidge larger than the star dots I’ve drawn. I position the cursor over a star, and hit the left mouse button to give the airbrush a squirt. The result is a nice looking round star with a dark center and a small semi-transparent halo. When I am satisfied with my drawing, I’ll take the last step, “Invert,” which in Photoshop gives you a negative image. Since your drawing was already a “negative,” doing that makes it a positive with white stars and nebulosity. By the way, I rarely use color in my drawings. I usually don’t see it in the eyepiece, and when I do, in some planetary and emission nebulae, it’s pale, very pale. I like the look of a black and white drawing better, anyway.